This computer was created and made in France by a company called RTC. It was the first home computer released by Philips. 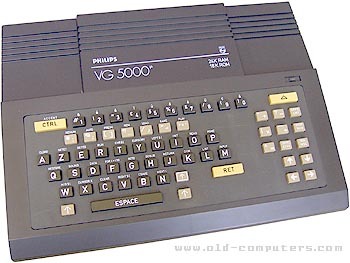 It was not MSX compliant and or compatible with the other Philips VG computers. The basic was written by Microsoft. It was designed to be a cheap computer for beginners and school purpose. Philips planned to develop a lot of peripherals for this computer : synthetiser, memory card, floppy disk unit, videodisc interface, etc... but none of them was realised. Finally, it had a limited success. see more Philips VG 5000 Ebay auctions !